Same here. That Del Monte coupon in the Chinese New Year insert (.50 off WUB1) is a hot one. Yeah I've been to coupon boards in two different cities & they're .50 off WUB 2. I'm trying to remember, was it .50 off 1 last year or $1 off 1? I remember getting some good deals! Abby1 last year from the coupon board it was .50 cents off wub1 and it was the. I remember last year doing a few trades with the last years Chinese new year insert on said coupon because people I think out west are allowed to stack. Yup, last year the tearpad was .50 off WUB1. Jouelle89 posted it here. Thanks to you both for jogging my memory! That was a good coupon. 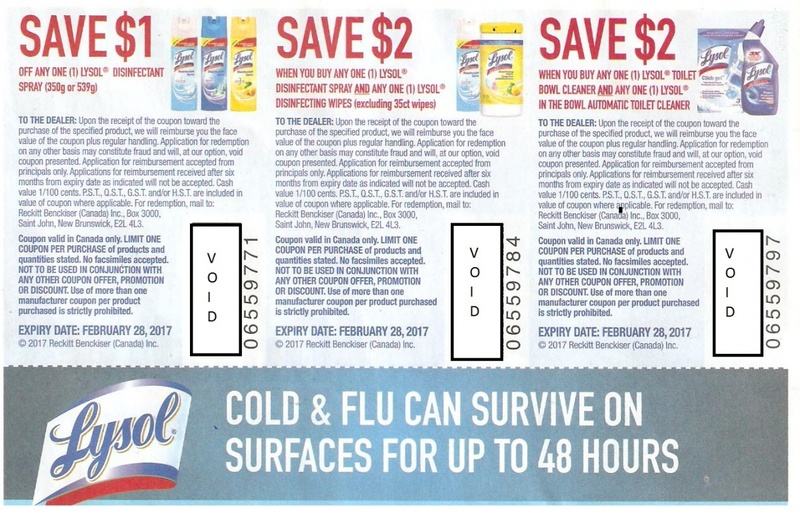 This publication includes 7 coupons and 6 mail in rebate (MIR) offers. All contents of this publication are also printable from www.smartsaver.ca with the exception to the MIR, MegaRed Omega-3 Krill Oil, which is only available in the printed paper edition (see below). 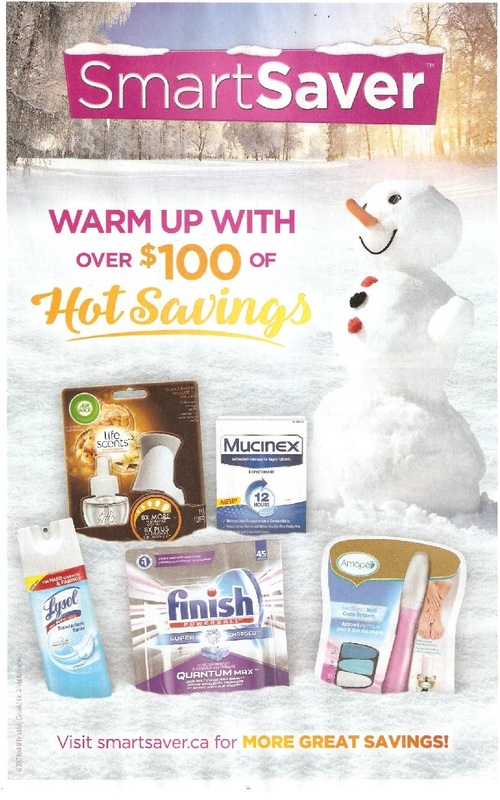 MIR up to $17.25 on any Air Wick Freshmatic or Scented Oil Starter Kit. Purchase between January 23, 2017 and February 28, 2017, and received on or before March 28, 2017. 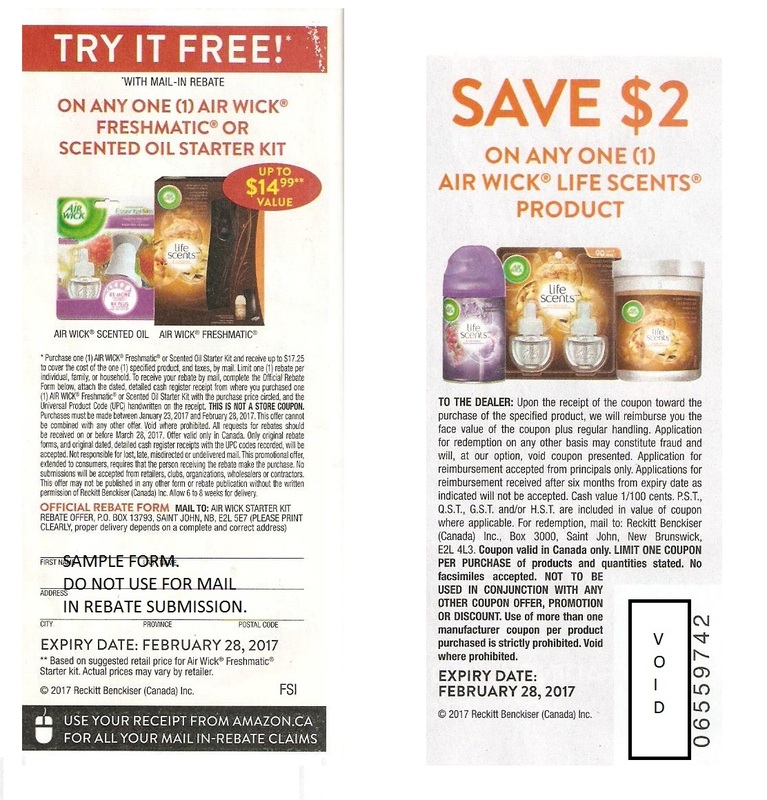 Mail to Air Wick Starter Kit Rebate Offer, PO Box 13793 Saint John, NB E2L 5E7. MIR up to $8.00 on Resolve Gold Oxi-Action (Powder or Gel, 625g or 1L), Resolve Oxi-Action (Powder 765g) or Resolve Crystal White (Powder 765g) In-Wash Stain Remover and 1.5kg Powders. Purchase between January 23, 2017 and February 28, 2017, and received on or before March 28, 2017. Mail to In-Wash Remover, PO Box 13802 Saint John, NB E2L 5E7. MIR up to $16.00 on any Duerx Play Pleasure Gel (100ml or 200ml). Purchase between January 23, 2017 and February 28, 2017, and received on or before March 28, 2017. 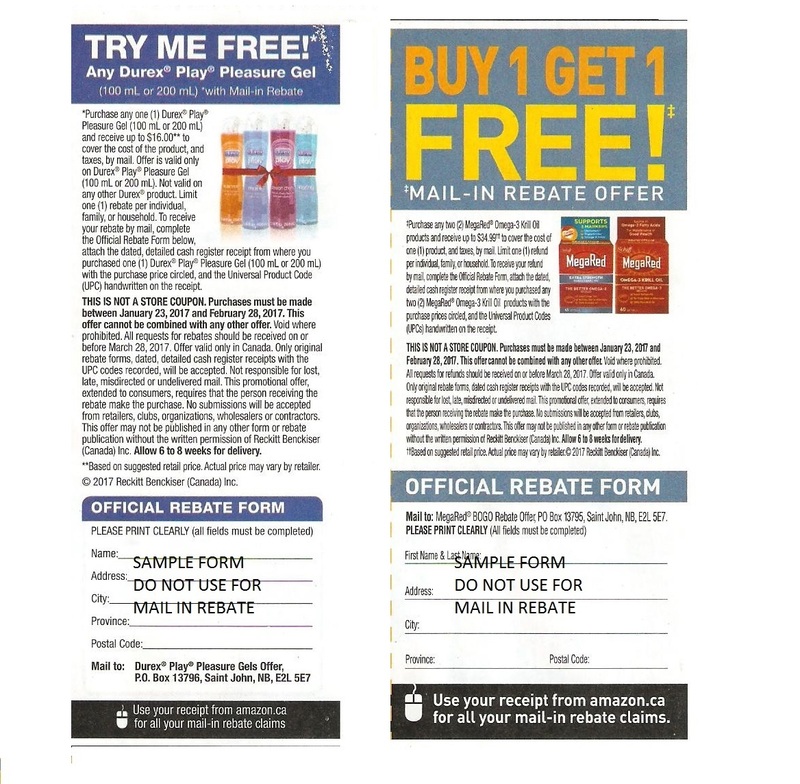 Mail to Durex Play Pleasure Gels , PO Box 13796 Saint John, NB E2L 5E7. MIR up to $34.99 to cover the cost of a MegaRed Omega-3 Krill Oil , when you buy two MegaRed Omega-3 Krill Oil on the same receipt. Purchase between January 23, 2017 and February 28, 2017, and received on or before March 28, 2017. Mail to MegaRed BOGO Offer, PO Box 13795 Saint John, NB E2L 5E7. MIR up to $8.00 on any Finish Dishwashing Cleaner, Quantum Max, Quantum Max Power&Free, Max in 1, Max in 1 Power&Free (18ct or larger). Not valid on base All in 1. Purchase between January 23, 2017 and February 28, 2017, and received on or before March 28, 2017. Mail to FINISH Free Dishwasher Detergent Product, PO Box 13800, Saint John, NB E2L 5E7. MIR up to $6.00 on any Finish Dishwasher Cleaner, Freshener or Rinse: Jet-Dry, Quantum Jet Dry (200ml or larger). Purchase between January 23, 2017 and February 28, 2017, and received on or before March 28, 2017. Mail to FINISH Free Dishwasher Detergent Product, PO Box 13801, Saint John, NB E2L 5E7. Last edited by rockco; Fri, Jan 27th, 2017 at 12:32 AM. Grey, hcao, mcminsen and 4 others like this. Someone stole flyer bundles off our street, I saw the guy delivering but by the time I went out to get it, gone?? My neighour had grabbed hers and said she saw one on my deck. I guess this explains why, someone wanted a bunch of MIRs and Lysol? Ciel, Lavender Lady, rockco and 1 others like this. 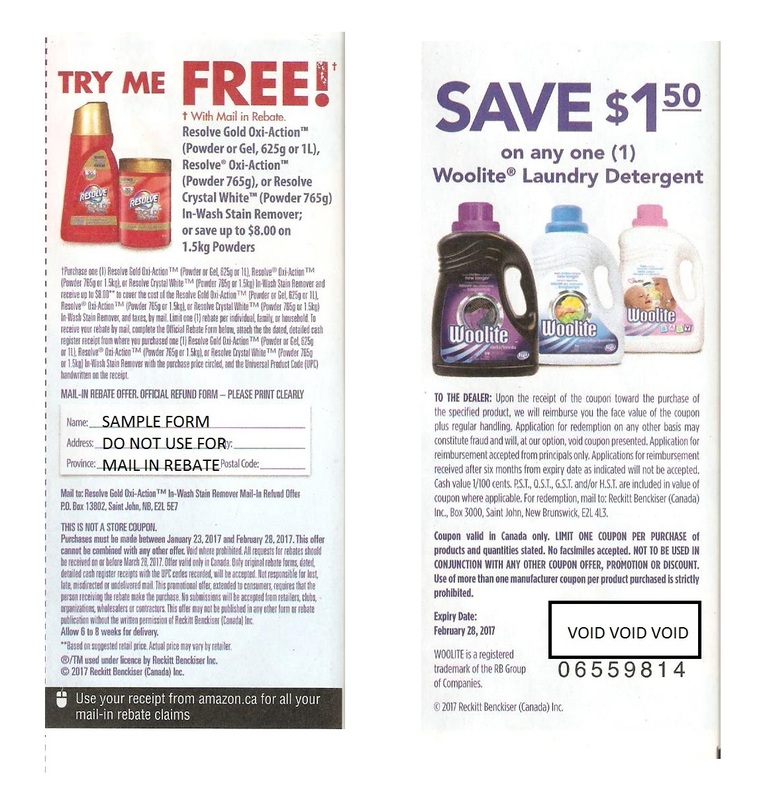 Metro has the Woolite on special for $9.99 (smaller jug) in their current flyer-so that could be a hot deal for the "snatcher" or there is a demand for one or more of the offers online. Curious to know that someone is timing the haul right after delivery. Maybe they needed lots of that Durex play gel for free. Ha. Ha..
lotsasavings, Ciel, Cuckoobird and 3 others like this. There hasn't been a Walmart Live Better magazine in a while. I know ive been thinking the same thing when i was in wamart the other day. If anyone sees a new issue in there stores soon please let me know. The social media channels for WM live better are all 404 messages now. The magazine site redirects to Walmart.ca. Rogers published the magazine for WM-the title could have jumped the shark in 2017 with some of the other Rogers magazine titles that are discontinued or went digital only. WM magazine site was still active in January-cover page was still the December 2016 one. So if you have back issues, make sure to clip your recipes because you won't find them online and also check for coupons still useful. Does that mean there wont be a walmart live better magazine anymore ? i really hope not.